We're over and out on this page. Follow this link for Arsenal v Manchester United, which has been a corker so far. And don't forget: Match of the Day, BBC One, 22:20 GMT. Tottenham boss Mauricio Pochettino, speaking to BBC Sport: "We deserved more. In the second half we played more than 40 minutes with one less and the team was brave and tried to win the game. I am happy. In the last few weeks we have been frustrated but the face the team showed today was good. Sometimes you need to feel that frustration and learn. "It is so difficult to play with one less. I think it was important miss for us but the good thing is we did not concede. We were close to scoring. We handled the game well during the second half and I was happy with the performance. "I think it wasn’t intentional for Davinson (Sanchez) to make what he made. I am not going to talk about the refereeing decision any more. For me one of the first questions is about a controversial situation. My decision is not going to change it. "It is important for us to change the feelings. We were disappointed after Leicester. We are in a period now that we suffered things against us. It is good for the group to try and learn. It is a long-term project. It will be good for the future. You want to win but in tough moments you learn." Watford manager Marco Silva, speaking to BBC Sport: "We did everything to win. Like Tottenham. It was a tough game for both teams. We knew before the match that they would have more possession. We know against Tottenham we can lose our balance in a counter-attack. Against 10 we tried everything and had chances to score. We took one more point. "In some moments in the last decision we need to do better. In the last cross and the last decision, it is not the best. "We need to keep going. Nothing changes for us, working the same way. In the last game against Manchester United we did our best. The players again showed good commitment and attitude. This is our way. "Everybody knows what is our hope – to remain a club in the Premier League. We started well and everybody is enjoying. I want everybody with their feet on the floor. This game showed me we need to improve a lot and continue working hard." Stoke boss Mark Hughes, speaking to Sky Sports: "We needed the three points. We haven't got the results we deserved in recent weeks, we just needed to get the job done. The last period when they were throwing balls in our box we handled it well but I felt we could have scored a few on the counter. "Jack (Butland)is a top level keeper - that is why once he said he was fit to go we were always going to bring him back in." 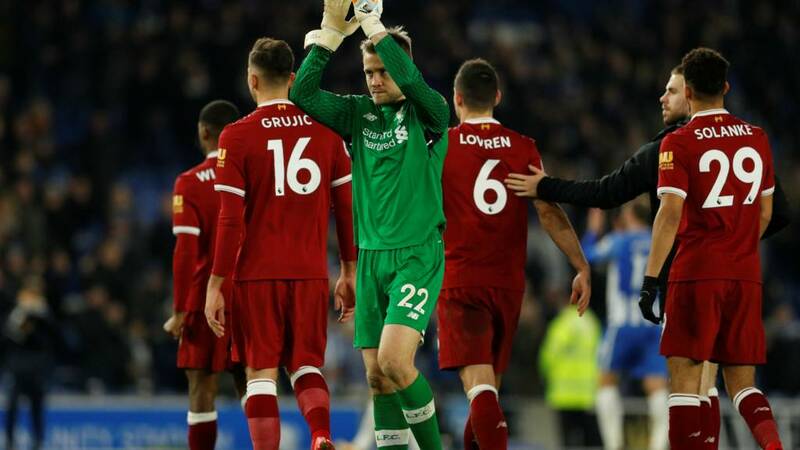 Brighton goalscorer Glenn Murray told BBC Sport: "We knew what Liverpool were capable of and that's what happens when you play the big boys. "It's all about how we come back from this now. With the quality that Liverpool have going forward, it's all about stopping them. "We weren't at our best and we never really got going. It's one to forget for us. "It's one of those things that is going to happen when you get promoted to the Premier League and it's all about how we react now." Liverpool captain Jordan Henderson told BBC Sport: "It was very good, the performance was good for 90 minutes. We're disappointed we didn't keep the clean sheet but overall we're delighted with the result. Did his push warrent the penalty? "I don't think so. People made their mind up on it. I thought it was soft and I told the referee that. "They scored the penalty to try and lift it but we scored some brilliant goals. The front three were breathtaking at times." Swansea boss Paul Clement, BBC Sport: "It's not just frustrating because of the result and performance today but the whole period we are in. We are bottom of the table and deserve to be bottom. "I can't say we are unlucky, we've just not been good enough. Today was typical of us. We got off to a great start and it looked encouraging. But then there was a big mistake for the first goal, and I'm also disappointed with the second goal, we were too deep. Leicester manager Claude Puel: "On the pitch it was a difficult game, they are sixth and with confidence. We saw this in the first half. It was important to win this game. I think it's a good result and a good reward for the players and their hard work on the pitch. It's encouraging to see different players and it was a good thing for Demarai he scored. We need to continue to improve all of the time. We need to keep this positive attitude,"
Burnley manager Sean Dyche to Match of the Day: "They're in good form. It was a poor goal from our point of view. In the second half it becomes a bit more like a basketball match and they defend and counter. At the end we have a chance to nick one but not the rub of the green. We like the fact we are keeping games tight, that's an important theme for me. I've said to the players: 'We're progressing.'" On Robbie Brady who was stretchered off in the first half: "We're waiting on news but we think it's more serious than not serious. We'll just have to wait and see." Huddersfield manager David Wagner tells media: "We will keep on fighting and keep on analysing. Today we can analyse we were not good enough, especially in the final third. The quality was not good enough but the players have shown they have it." More from Roy Hodgson, on the fact late injuries meant Palace only had five substitutes on the bench: “The 18 is a comfort zone, you rarely need that many subs. You’ve often got three in mind who are likely to play. We were lucky nothing happened to Julian Speroni as we don’t know who’d have played in goal. “Wayne’s back went into spasm. It’s not the first time it’s happened. We’re not blessed with back spasms, we had Ruben Loftus-Cheek too." West Brom boss Alan Pardew to BBC Sport: “If we work like that every week, I’ll be pleased. We had a lot of quality not available today, with injured players. We lacked a bit around the box but in terms of effort, we were very good. “We bossed the game, except for one spell. Palace are in a good place. They’re difficult to break down. Having said that we created some nice moments. Some composure and we might have won. We were really good in the second half. I’m looking forward to working with the guys. More from Everton boss Sam Allardyce, speaking to BBC Sport: "I had some work to do tactically at half time, mainly on Sigurdsson and Lennon not running too far back. I have to say, it got us the first goal. Sigurdsson was further up the pitch than he would have been. It was something we really needed. "I've learned the squad can dig in and be resilient already. They know they let too many goals in before I got here and that has to stop. We can build on the attacking play more once we have established that solid defensive unit." On the January transfer window: "I know the positions we need. I don't know the players we will get yet. I would like to focus on the players who are injured and get them fit as quickly as possible. Ross Barkley back in the squad, that will make a difference to our quality, particularly in possession." Not that we want you to leave this page, but Arsenal v Manchester United updates can be found on this link. They're under way at the Emirates. Everton boss Sam Allardyce, speaking to BBC Sport: "It was nice to see this stadium, looking around and seeing it full with the welcome. Then it was about the players delivering a performance and result today. "This was probably their first back-to-back wins this season. The effort from the players in the second half, they really wanted to win it after finding it difficult in the first half, maybe with a bit of fatigue. "The first goal settled us down. Defensively, did Huddersfield have a chance today? That gave us a platform to go and win the game. "Our third clean sheet of the season, that's two on the trot and ironically we have two wins from it. "It could have been better for entertainment, more passing and moving but we can build on that as we go on." Crystal Palace boss Roy Hodgson to BBC Sport: “In the build-up to the game, everything that could go wrong did go wrong. We spent hours on a train stuck on the tracks. We lost Scott Dann overnight and Wayne Hennessey in the warm-up. The scenario couldn’t have been much worse. But I’m really pleased with the way we played and it was a well-deserved and valuable point. “Some of our play in the first half was good. We asked a lot of questions. We should have had a penalty when Ben Foster brought down Wilfried Zaha. We’ve not been lucky there either. 0-0 was probably a fair result over 90 minutes. Neither side dominated for long spells. Swansea boss Paul Clement, speaking to Sky Sports: "The performance sums us up. At times we played good football, we got off to a great start, scored with the kind of move we spoke about, and up until they scored their goal we were the better team. Then we gave the all away in a key area. The goal is a gift. The second one is very typical of their style at times; long ball, we are a bit deep, and you can't expect to always win he ball in the air against Peter Crouch. "At 2-1 though there is a long time to go and I'm really disappointed with the way we continued after that point. We didn't play well and we deserve to be bottom of the table the way we have been playing. "We are alright Monday to Friday, but that's not what it's about is it? I can control the line-up, what we do in training, how we communicate that to the players. But clearly that isn't working at the moment and I have to find other ways." Brighton manager Chris Hughton speaking to Sky Sports: "It was tough but we always knew at this level that if we don't play to the levels it can happen. The last two goals, with the momentum they've got, you can see what's happened. The first three goals were the most disappointing. "We were too naive and we haven't been like that against anybody. We got served a lesson today and we need to learn from that. "The disappointment from conceding the first goal from the set play, the emotion should switch on the organisation, but when they score less than a minute later it becomes harder. "It's been a tough week and perhaps that's showed. "We've been good so far and this was our toughest test. We've fallen short and they're now aware of what can happen. Occasionally, we are going to get days like this. Importantly it's about how we bounce back." Leicester's match winner Demarai Gray to Match of the Day: "I anticipated where the ball was going to go and luckily it fell to me. I had a collision with the post, it's about getting the points and putting the ball into the back of the net. When I play I've just got to try and do what I do best. As long as we keep performing like that, we'll be OK. I struck the post and as a team we had many chances to see the game off in the second half." Stoke manager Mark Hughes, speaking to BBC Sport: "We got off to the worst possible start so we had to show character and clear our heads to understand what Swansea were doing - we haven't faced a diamond formation many times this season. "In recent weeks we've probably played better than this and lost but today we showed different qualities. "Really we should have finished the game off earlier than we did but we'll take three points and hope we start climbing up the table now."